It’s time to strap in and saddle up for Mr Green’s latest promotional prize draw. This Wild West adventure will treat 200 players to generous rewards simply for staking and playing in the rip-roaring Dead or Alive slot. If you play along with this outlaw-themed offer, you’ll be in with a shot of a share of £5,000. Keep on reading to find out more. 200 lucky players will be named winners in this random prize draw. If you fancy your chances of saying howdy to these high cash prizes, mosey on down to Mr Green Casino right now and start playing. To get involved with Mr Green’s Dead or Alive promotion, sign into the site on a mobile device between now and January 15th. It’s important to note that only gameplay on a mobile device will qualify you for the offer. Every 20 rounds at a minimum of 9p per spin you play in the Dead or Alive slot will earn you one entry into the prize draw. Each player can enter into the draw a maximum of 50 times every day. With those incredible prize draw rewards waiting to be won and so much cash on offer in the slot itself, why not start spinning and winning right now? 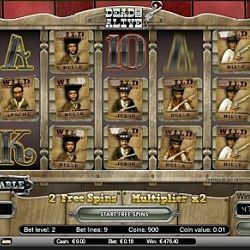 This wonderfully western slot from NetEnt has everything going for it- from great graphic design to brilliant bonuses and gameplay action. As keen slot players around the world are well aware, the NetEnt team always go above and beyond when it comes to their theme designs. Here you’ll find a whole host of animated outlaws, from Jesse James to Billy the Kid, acting as symbols on the reels alongside iconic cowboy images like boots, gun holsters, glasses of bourbon and sheriff badges. To really get you in that Wild West mood, a backing track that wouldn’t seem out of place in an old John Wayne movie plays throughout the game. Dead or Alive has five reels and nine pay lines to play with. It can be played for between 9p and £18 per spin and is packed full of bonus features such as free spins, wilds and scatters. The promotional period lasts from the 13th until the 15th of January. Only gameplay in the mobile version of Dead or Alive slot during this time will count towards prize draw entries. All registered members of Mr Green Casino are welcome to take part in the offer. All winners will have their cash prizes credited to their Mr Green Casino accounts within 72 hours of the random prize draw taking place on January 16th.